Our product range includes a wide range of pallet hood. 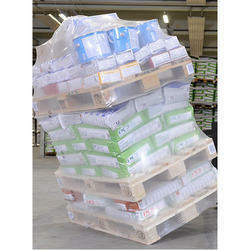 We manufacture, import, supply and export best quality Pallet Hood. Offered by us at reasonable prices, these hoods are used as a cover for securing various pallets from environmental abuse. We have been able to offer these hoods in these hoods in bulk quantities due to our large production capacity. These hoods can be customized as per the specifications provided by the customers.